FileWriter creates a Writer that you can use to write to a file. FileWriter is convenience class for writing character files. The constructors of this class assume that the default character encoding and the default byte-buffer size are acceptable. To specify these values yourself, construct an OutputStreamWriter on a FileOutputStream. FileWriter(File file) - Constructs a FileWriter object given a File object. 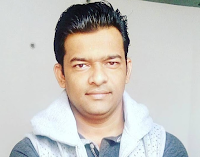 FileWriter(File file, boolean append) - Constructs a FileWriter object given a File object. FileWriter(FileDescriptor fd) - Constructs a FileWriter object associated with a file descriptor. FileWriter(String fileName) - Constructs a FileWriter object given a file name. FileWriter(String fileName, boolean append) - Constructs a FileWriter object given a file name with a boolean indicating whether or not to append the data written. void write(String text) - It is used to write the string into FileWriter. void write(char c) - It is used to write the char into FileWriter. void write(char c) - It is used to write char array into FileWriter. void flush() - It is used to flushes the data of FileWriter. void close() - It is used to close the FileWriter. This program writes character streams to file "sample.txt" file. This example uses the try-with-resources statement to close the resources automatically. 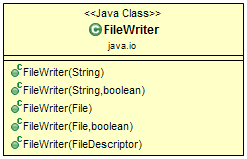 * The class demonstrate the usage of FileWriter class methods.